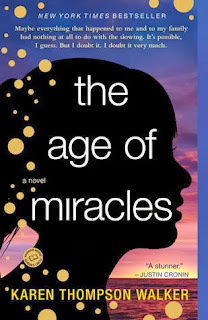 This is not a book I would have picked out for myself--if it weren't for my book club, The Age of Miracles would have stayed off my radar. But that is one of the upsides of a book club--they introduce readers to books they would normally never read. The Age of Miracles is a very unsettling book. The plot is certainly imaginative, although my engineer husband insists that what I described from this book is not an accurate representation of what would happen if the Earth's rotation suddenly slowed. Whatever--if you are a Science person, keep that in mind. If you aren't a Science person, don't worry about it. That being said, there is quite a bit that is incredibly realistic in this book. Julia is as true a representation of a tween that I've seen in a long time. She battles with her own self-esteem, her friendships and even her first love. She watches as her parents' relationship morphs and how her society is slowly torn apart by the "slowing." The Earth's rotation slowing may seem to be a far-fetched idea, but the reaction of society to something unknown and threatening is very, very common. I could not put this book down. I won't say it was a "fun" book to read, but it was definitely enthralling. While I would highly recommend this book, I would caution prospective readers that they are in for something that just might shake them to the core. This isn't a book I would have picked up on my own either, but your review was drawing me in and then when I got to "I would caution prospective readers that they are in for something that just might shake them to the core. ", I was hooked. Adding this to my list! LOL, engineers are always trying to ruin books ;) I liked this one quite a lot. I think I was struck by how even when the world is going bonkers there are still personal problems to deal with.